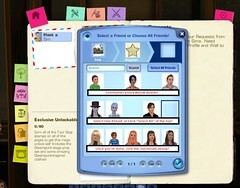 Simport is the Sims 3 Showtime’s exclusive social feature. Simport allows you to send your Sims on tour to another player’s game, and allows you to host another player’s Sim. Simporting between games will boost your Sim’s career, unlock exclusive sets with props and outfits, and add Simoleons and Lifetime Happiness Points to your household. The Simport feature only works if both the sender and receiver have Showtime installed. Simport allows you to send up to four Sims in your household, but only allows you to host one Sim at a time. 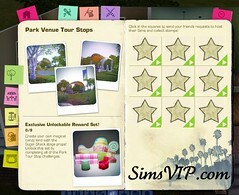 The Sims that you send and receive, must meet the criteria and experience required for the specific tour stop. If your Sim is a level 10 in Acrobatics for example, they will not be able to perform a tour stop which requires a Level 7 Acrobat, even though their level of expertise is above the requirement. 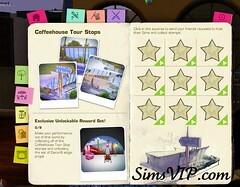 Each Sim must fit the criteria for any specific tour stop. Accepting and sending Simport requests can be done within your Simport Book, as well as your in game Player Wall. You have the option to send out Simport requests to anyone on your Sims3.com friend list specifically, or you can post a general request which can be accepted by any member on your friends list. ♦ Before sending and receiving Simport requests, it is highly recommended to save your game. 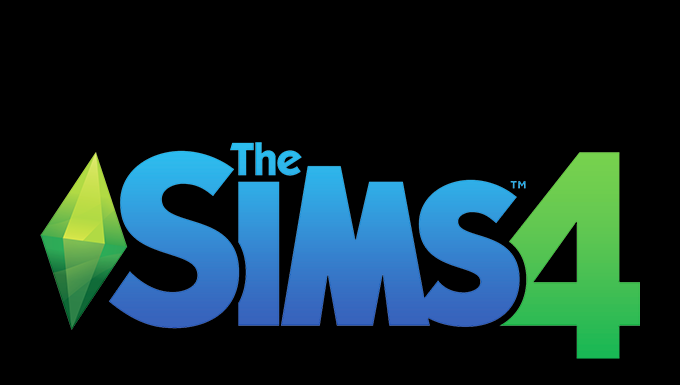 In the event of any lost Sims, crashing, or other unfortunate issues while Simporting, at least you will have the latest save of your game. 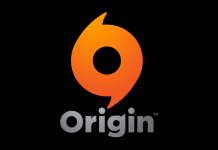 ♦ Third Party Custom Content & Sims 3 Store Content will not transfer with Sims. If a friend sends you a Sim with any content you do not have in your own game, the Simport process will automatically replace them with default items in your game. ♦ When Sending and Receiving Simport Requests, you do not have any control over the touring Sim. When you send your Sim into someone else’s game, you will not see your Sim, but you will receive notifications of what is happening if you are online at the time. Simport is not a form of multiplayer gameplay. ♦ Simport requests are only valid for one (1) day. If the request has not been fulfilled within a 24 hour period, you will have to resend the request. 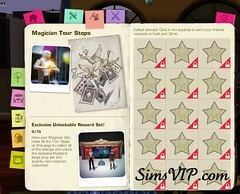 If you do not attend a Simport performance, you will not receive any tour stamps or rewards. ♦ It is required that you have a minimum of two Sims in a household in order to Simport. There are two ways to send your Sims on tour. One way is to accept Simport Requests from friends who want to host a Sim, and the other is to send a Sim of your choice, while selecting when and where to perform. You can only accept Simport requests from friends if you qualify for the tour. 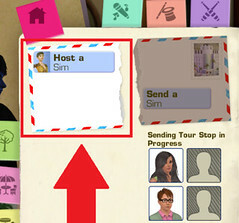 To begin Sending Sims on tour, open your Simport Book and select “Send a Sim”. You will then be guided through steps to help you choose a Sim to send, a Venue Location, Career Type and a friend to host your Sim. Depending on what career Sims you have available in your household, will depend on which career stamps are unlocked for use. If you have any career Sim in your household, all venue stamps will be unlocked, however not all career stamps may be unlocked. For example, if you have only a Singer in your household, the Acrobat & Magician Stamps will be locked until you have a qualified Sim. 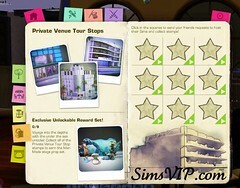 Another example of locked stamps is when a Sim in your household does not qualify for certain tours. Now that you have chosen a qualified Sim from your household, you are ready to choose your Venue and Career type. You can choose from 5 Venues and 3 Careers. You are now ready to select a friend(s) to host your Sim! You can choose one friend in particular, or you can choose to send out a mass Simport request. Sending a mass Simport request will allow everyone on your friends list, a chance to accept. Only one friend will be able to accept, complete and be rewarded per request. Pick a friend, any friend! 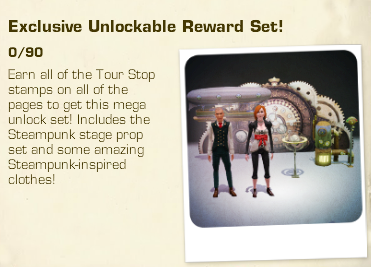 Your Sim will be held in the “Pending Simport Tour” box until someone accepts your Sim into their game. Once someone accepts the request to host your Sim, your Sim will become uncontrollable and leave in a Limo. Once your Sim performs for your friend, you better hope they make it to the show! 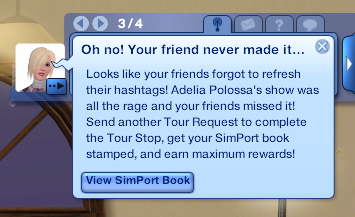 If your Sim completes the tour, but your friends never made it to the venue to watch, you will not be rewarded with a Simport Stamp or extra Simoleons/Lifetime Points. If your friend successfully attends your Sim’s show while on tour, you and your friend will be rewarded with a Simport Stamp. This completes your Simport Send Request, and your Sim will now return home. If you’re lucky, you may even come back with some awesome inventory goodies that were thrown at you during the concert! You will however, receive Simoleons and Lifetime Happiness Points for your time. There are two ways to Host a Sim. One way is to accept Simport Host Requests from friends who want to send a Sim on tour, and the other is to host a Sim of your choice, while selecting when and where a Sim will perform. 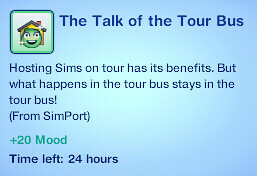 To begin Hosting Sims on tour, open your Simport Book and select “Host a Sim”. You will then be guided through steps to help you choose a friend who’s Sim you want to host, a Venue Location and a Career Type. When hosting Sims, you do not need to worry about any career type stamps being locked. Those will remain open during a Host, but only a friend who’s Sim fits the criteria will be allowed to accept the Simport request. To begin hosting a Sim, select the Venue & Career type! Once you have decided on a “who” and “where”, you can select either a specific Sim to host, or send out a Mass Simport Hosting request to your friends list. Sending a mass Simport request will allow everyone on your friends list, a chance to accept. Only one friend will be able to accept, complete and be rewarded per request. 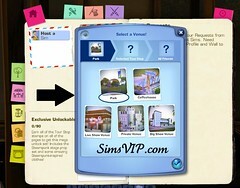 One a friend accepts the invitation to send their Sim to your game, you will be greeted with a notification, letting you know who has accepted. You will then be allowed to confirm your decision on completing the hosting request. Once you have accepted the request, your friend’s Sim will be on their way to your town! You will be notified of their arrival, so make sure you attend! 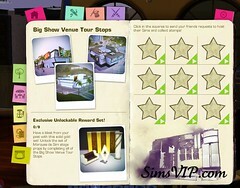 If you do not attend the Sims’s performance, you and your friend will miss out on the rewards! On the day your friend’s Sim is scheduled to arrive, you will be able to check the Map View of your town for details on their show. The venue at which they will perform, will display a red marker. About 15 minutes before the show, your game will ask you to choose the Venue Set up. 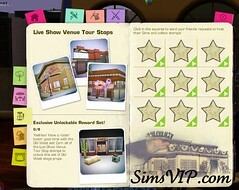 You can choose to create a custom stage with Buy Mode Props, or you can use the Venue’s default layout. Once you have decided on props, you can now sit back and watch the show! During the performance you can even toss some items at the Sim, which will land in their inventory and go back home with them. Once the show ends, the Sim will return to their home, and your Sim may even receive an awesome moodlet! During the time you spend sending and receiving Sims between games, you and others will be rewarded by completing the stamp sets in your Simport Book. 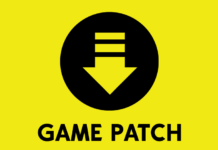 ♦ Unlocked rewards will automatically be added to your game.